Picking the best school can be confusing but luckily the Princeton Review teamed up PC Gamer to develop the top schools for video game design. Below are the top 10 schools and what makes them the best choice for you. The NYU Game Center was established in 2008 and offers a 2-year Master of Fine Arts, which puts an emphasis on designing game and also includes programming, visual design, critcism and of course, game design. This is a prestigious and multicultural University, which campuses in New York, Dubai and Shanghai. The New York campus is located in the stunning Greenwich Village in Manhattan, so you know you will have plenty to inspire you. While this may be the school for you the selection process is highly selective with only 33% of applicants being accepted into the school. If you are one of the selected, you will have an edge over other video game designers, so it is worth putting in the application. I don’t think anyone is surprised to see MIT on the top 10 list. This is a world renowned school for arts and technology, so being able to list this on your resume is always a bonus. Unfortunately, this iconic school is incredibly popular and as such as an acceptance rate of only 8%. This is further evidence of the type of education you will receive here. The quality of programs and tools at your disposal is second to none, which will undoubtedly make your stay here very rewarding. Okay, so this one is not on American soil but it is still a popular destination for video game designers. Since Vancouver is only a stone’s throw away from Seattle, it tends to attract a lot of creative Americans. There is a vibrant energy on the Vancouver campus (and in the entire city, for that matter) that drives creativity and develops an exciting atmosphere to learn in. The Art Institute offers a variety of programs with the most popular among game designers being their Bachelor of Science in Game Programming and their Bachelor of Applied Design in Graphic Design. This is the top rated school in Canada for video game designers and has been in the Princeton Review top 10 over the last 5 years. This is definitely one of the better schools for game design. RIT is a place where brilliant minds assemble and collaborate, where they pool together their individual talents across disciplines in service of big projects and big ideas. If that doesn’t sound like a place that is perfect for video game designers then I don’t know what is. Of course, it gets even better when you realize that their Game Design and Development program is one of the top rated programs in the world. Creativity is encouraged at RIT and you and your career will benefit from this vibrant and lively atmosphere located in Rochester, New York. Ranked at #6 on the list, their Interactive Media and Game Development (IMGD) program could easily be higher on this list. This renowned program provides students the opportunity to learn by doing. It also highlights content creation, design, project management, programming and testing. Essentially Worcester Polytechnic Institute provides a curriculum and a teaching method that allows their students to work in a hands on atmosphere. You will get everything you need to succeed in life after University with a degree from Worcester. This is the third and highest ranked video game design school from Massachusetts. Clearly, this is a state that is geared to fostering creative designers. One of the more unique features of Hampshire College is the flexible curriculum. Students will have the ability to pick and choose from a variety of courses to build the perfect program for them. There is definitely a focus on freedom for their students so you know you will have the ability to express your creativity in any way you see fit. The other amazing thing about this 5th best game design school in North America is the size. Your classroom will most likely only have 14 other people in it. With such a quality school being this small, you would think their acceptance rate would be incredibly low, however, they have an astonishing 67% acceptance rate, which means, you are likely to get into this prestigious college. While this University is world renowned for their research capabilities. they also have an amazing reputation in the areas of technology, art and design, so a degree rom Drexel will go a long way in landing your dream job. Drexel University is always on the forefront of technology. In 2000, they were the first school to create a fully wireless campus and they were also the first to create the Engineering Degree in Appropriate Technology. If you are looking to learn at a cutting edge University then Drexel is the place for you. DigiPen is also unique in that it allows their students to select individual courses as part of the Non-Matriculated Program. These credits won’t count towards your degree but they will definitely help you fine tune some of your other skills. This is the perfect all around school for learning about game design, programming, animation and many other aspects that will be useful for your future career. Located in the foothills of the Wasatch Mountain Range, you will not find a more beautiful or inspiring campus in the United States. Besides the beautiful aspects of the school, they also offer a variety of enticing programs. Their Entertainment Arts and Engineering: Master Games Studio (EAE: MGS) offers a Game Engineering, Game Production and Game Arts program, so you will have a tough decision to make when trying to figure out which track you want to explore further. This is just a few of the more pertinent programs. As you can tell, this school prides itself on offering the very best courses their game design students. If you are looking for a serious advantage over other applicants, graduate with a degree from the University of Southern California. 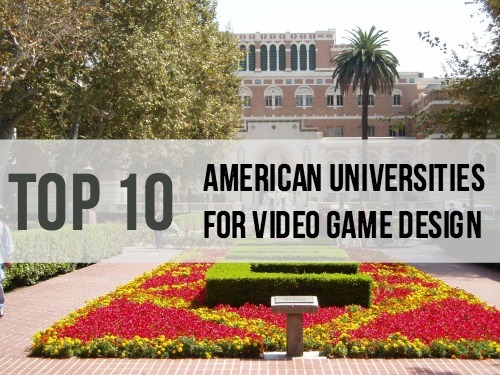 These are the top 10 Universities for Video Game Design programs in North America. If none of these schools do it for you, there plenty of other high quality game design schools across the country. Remember, you will be spending several years of your life attending this schools so choose one that fits with you.